Sarah Dessen is my homegirl. I don't actually know Sarah Dessen (though, Sarah, if you're reading this...hit me up), but she's been there for me since I was a teenager. I must have read Just Listen for the first time when I was in eighth grade back in 2008/2009. I can't remember the exact date, but I know it was around the time that I ordered my black iPod Classic because I have the quote "Don't think or judge, just listen" engraved on the back courtesy of that book. She's the author of thirteen books and I'm proud to say that I have read and enjoyed all thirteen of them. Once and For All, the newest addition to her collection of works, released on the sixth of June of this year. In looking up plot details to write this review of sorts, I read Sarah's note about the book in which she explains how she thought that Saint Anything would be her last book (released in May of 2015 and which I read last summer) and can I just say that I'm so thankful that it wasn't? 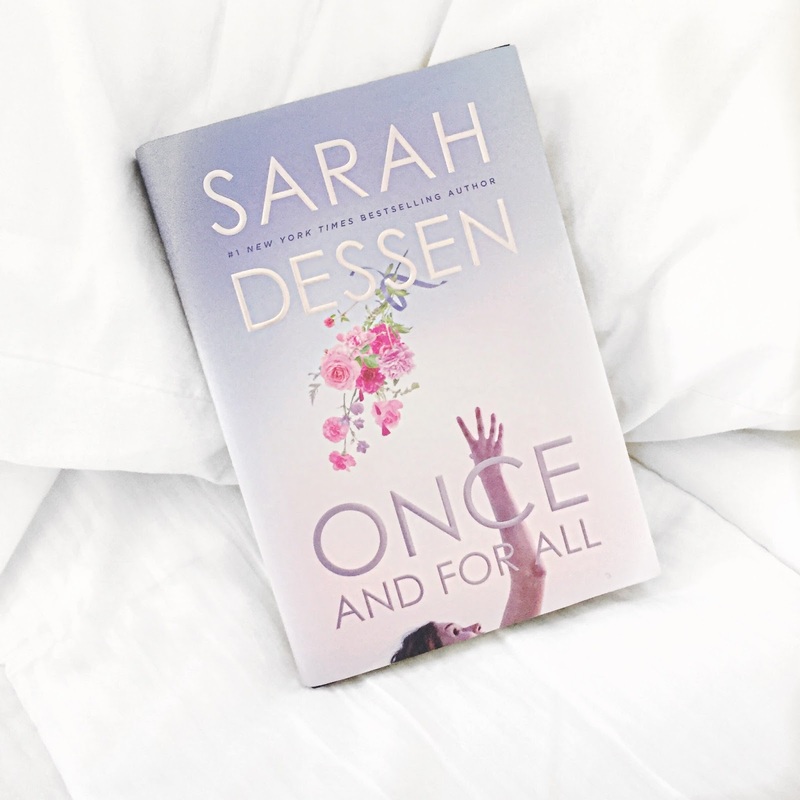 It would be selfish to wish that Sarah Dessen would write the same thing forever and ever, but her books are my favorite source of happiness bound together between a cover and a back. I mean, I bought this book in hardcover. That says a lot! I get a lot of joy out of reading books in which I can predict the ending. It's the same with romantic comedies. I know, for the most part, how they're all going to end, and I relish in the fact. I like that they cause me no stress or distress, for the most part. Though I will admit, the slow burn in some of these books has me on edge. I just want to smush their faces together and make them kiss!!!! I don't think that the fact that these type of books have a formula is necessarily a bad thing. I don't think it takes anything away from the writing of these authors. If anything, it's always fun to see what each author's take is on this hate to love kind of story line. I love reading about first conversations, first dates, first kisses, first anythings. I love the banter, the conversations, the growth of characters and their relationships. I JUST LOVE IT ALL, OKAY? I told my friend that I shouldn't make this comparison that I'm about to make, but you know what, it's the best way I can describe it. Pizza Hut. You still with me? Sarah Dessen books are like Pizza Hut. Pizza Hut pizza is not the best pizza in the entire world, you see, but Pizza Hut pizza is rarely horrible. It's consistently good. If all else fails, there's always Pizza Hut. That's sort of how I feel about Sarah Dessen's book. If I'm ever struggling with what I want to buy in a book store, I know that if there's a new book by her out, it will be a good read and I won't think it was a waste of money. Her books are consistently good, entertaining, charming, and always worth the money and the time spent reading. I would also like to redirect the topic very quickly to the negative connotation that Young Adult (YA) fiction gets in this world. Why does the YA genre get such a bad name? I feel like there's a common misconception about what the YA genre contains story wise. I think people misconstrue the idea of YA books, demoting them to cliche novels full of over the top or "Mary Sue" characters (and nothing in between), plot holes, and cringy dialogue. I suppose to each their own on their preferences when it comes to books, but I have a feeling most people will write off YA fiction books just because of the genre, assuming there will be unrelatable characters that they won't be able to connect with. I mean, I read almost exclusively about high school students or recent graduates when I've been out of high school since 2013 and just graduated from college. I'm a twenty-one-year-old reading about people getting their licenses and preparing for college when I haven't related to that in years. And yet, here I am, still enjoying my favorite genre. I don't think I'll ever really grow out of it, either. Are YA Lit books seen as inferior? That was supposed to be a rhetorical question, but I feel like we all know the obvious answer to that question is yes. Anyways, in conclusion, this might be my favorite book that I've read all year. It was extremely entertaining, made me literally LOL (few books make me actually want to laugh), and NEARLY MADE ME THROW THE BOOK OUT AT THE END. You'll see, my friends, you will see. Have you read Sarah Dessen's books? How do you feel about YA Lit? I love that you chose to hit on the topic of YA literature in this post. I love YA fiction, specifically anything that's also dystopian. I love it so much that it's often the majority of what I read. I was watching Friends from College on Netflix the other day and they kind of hit on what you said. I've learned more about the world from reading YA than I have any other type of fiction book. Great review! I'll definitely have to add this book to my TBR list! Omg! YEEES! I have been in love with Sarah Dessen books since I was in middle school too! I've been eyeing this book but haven't had the chance to borrow from the library yet. I can't get enough of YA lit either. I think a fun and fluffy read is always good.